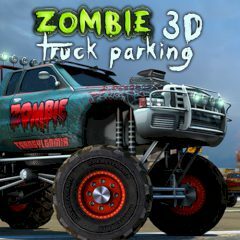 Drive your cool zombie truck and try to park is better as you can. Just use the arrow keys to move and you will cope with it. Do you think that it is so easy? Well, then just try it and improve all your driving skills. Have much fun here. This is the most exciting game you have ever played. Well, you have probably imagined yourself behind the wheel of many interesting vehicles, but this time we give you the chance of trying out an incredible zombie truck in this exciting simulation game, so you will have to drive and park it skillfully without crashing it by following the arrows on the road. By the way, you will only complete the game if you succeed doing it before the time runs out, cause there are many intense levels to try and amazing monster trucks to choose from. Enjoy it!